2011: Heuscher formed a partnership with Jefferson Bellaguarda and the duo won a bronze and a silver in their 10 events. They placed 17th in the World Championships in Rome. The duo finished fourth in the CEV European Championships. 2010: Heuscher and Heyer played in seven FIVB events with a best of seventh. In their only CEV event, the duo finished fifth in the European Championships. 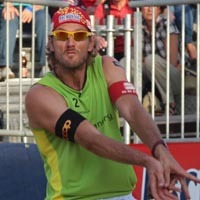 2009: Heuscher and Heyer had a best of fifth twice on the FIVB Tour. They placed ninth in the World Championships in Stavanger. On the CEV Tour they advanced to three finals, winning once, in five tournaments. They placed fifth in the CEV European Championships. 2008: Heuscher and Heyer played in nine FIVB tournaments, with a best of ninth five times. In the Beijing Olympics, they placed 17th. On the CEV Tour they played five times with a best of second, and placed fifth in the European Championships. 2007: Heuscher formed a new partnership with Sascha Heyer, and they won a bronze in their first event. In their third tournament, the duo lost in the first round but then won seven straight matches en route to a silver medal. In the World Championships in Gstaad the duo finished 17th. They won an FIVB satellite event in addition to a CEV event, and placed ninth in the European Championships. 2006: Heuscher and Kobel won the second event they played in, one of two semifinals for the year. They also won their only FIVB satellite event. On the CEV Tour the duo played in four tournaments, with a best of third in the European Championships. 2005: Heuscher and Kobel advanced to the semifinals twice on the FIVB, winning one bronze and one gold. In winning the Grand Slam in Paris, the pair won seven straight matches following a second-round loss. The duo placed 17th in the World Championships in Berlin and finished sixth in the season rankings, one of three teams from Switzerland in the top seven. Heuscher and Kobel won their only FIVB satellite event, and placed third and then second in two CEV events before finishing second in the CEV European Championships. 2004: Heuscher and Kobel advanced to the semifinals in seven of the 11 FIVB tournaments. The pair won the Gstaad event to go with three silvers and two bronzes. In the Athens Olympics they won the Bronze Medal after losing only one match, to the gold medalists. They ended as the third-ranked team on the FIVB Tour. In their only CEV event the duo placed third in the European Championships. 2003: Heuscher and Kobel won two bronze medals, including one in Switzerland. After having just one finish lower than ninth, and placing fifth in the World Championships in Rio de Janeiro, they ended the year as the fourth-ranked team on the FIVB Tour. The duo won an FIVB Satellite event and played in two CEV events, including finishing fifth in the European Championships. 2002: Heuscher and Kobel had six ninths in their 10 FIVB events and won their first medal, a bronze in Stavanger. The duo also placed third in an FIVB Satellite event and fifth in the CEV European Championships. 2001: Heuscher and Kobel advanced to their first semifinal in Berlin after winning five straight elimination matches, placing fourth. The duo also placed second in an FIVB Satellite event and ninth in the CEV European Championships. 2000: Heuscher and Kobel played in six FIVB tournaments, losing three times in qualifiers and being seeded directly into the main draw three times with a best of ninth. They advanced to the title match in all three FIVB Challenger events in which they competed, winning two of them. The pair got a second place on the CEV Tour before finishing seventh in the European Championships. 1999: Heuscher and Kobel played in three FIVB qualifiers but did make any main draws. They placed ninth in an FIVB Satellite event. In three CEV tournaments the duo had a best of second place. 1998: Heuscher formed a partnership with Stefan Kobel, playing in four FIVB events. They advanced from one qualifier, placing 17th. The duo also played in a pair of Challenger events with a best of fith. 1997: At the age of 20 Heuscher played in his first FIVB event, losing in the qualifier with partner Bernhard Vesti. • In the 2004 Athens Olympics Heuscher qualified with Stefan Kobel as the fifth seed. The duo went 3-0 in pool play, then won both matches in bracket play to advance to the semifinals. The pair lost to the top-seeded team in the semifinals before defeating Australia's Julien Prosser and Mark Williams to capture the Bronze Medal. • In the 2008 Beijing Olympics Heuscher qualified with Sascha Heyer as the 11th seed. The duo went 1-2 in pool play, then lost the lucky loser match, placing 19th.